Greetings from rainy California! We’re finally getting our much needed rain – and not just a sprinkling! I’m happy to report that this week brought a full-on downpour that lasted almost 2.5 days and more is expected over the next couple of days! It’s been cold, foggy and dreary-looking – but no complaints from me. With any luck we’ll be able to get rid of the bucket we keep in our shower to collect water for the garden! LOL! It’s been quite some time since I visited my little studio – it’s only a few steps to the other side of the house, but it seems time and circumstances were conspiring against me. 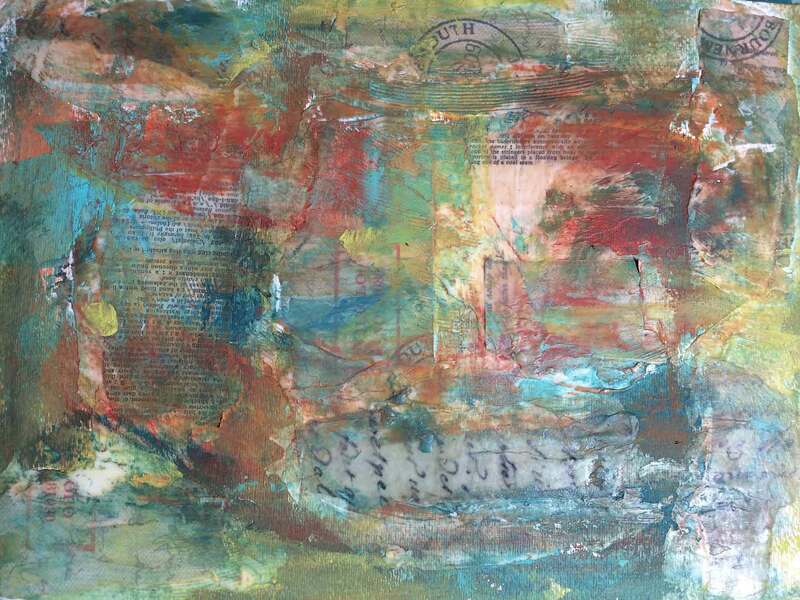 That’s another reason I welcomed the rain … hello paints … hello Gelli plate … hello rubber stamps …!! Here’s a sneak at what I’m working on for a new product. Already had a color scheme in mind, so I mixed up the colors and pulled out some mixed media paper. Working on two pieces at once, I used gel medium to adhere strips of book paper, handwritten text and some post marks. I added acrylic paint in most areas using a palette knife and a credit card and once it was almost dry I wiped away some of the paint with a baby wipe. I used Neocolor Water Soluable crayons in some of the other colors to fill in areas I had wiped away and areas without paint, activating the color with water and a paint brush. When that was dry, I used a credit card to apply white gesso to most of the pages and then, when that was partially dry and again using a baby wipe, I removed some of the gesso and more of the paint. Using the gesso this way has the effect of unifying the various colors on the page. 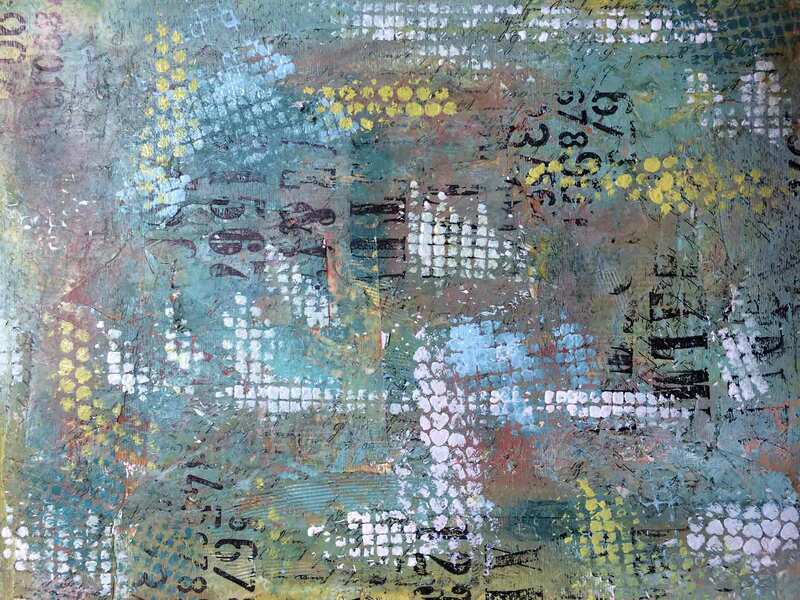 Once that was dry, I added more acrylic with my fingers, rubbing it in some places and removing it in others. I added some text and number stamps and then used punchinella and some of that gridded tape used by contractors on wallboards to add more color and texture. Here’s one of the finished backgrounds – I’ll use it in an upcoming digital art journaling kit, but once I’ve scanned it, I’ll also use it for a background of a journal page, or cut it up for fodder. I just love all this texture! 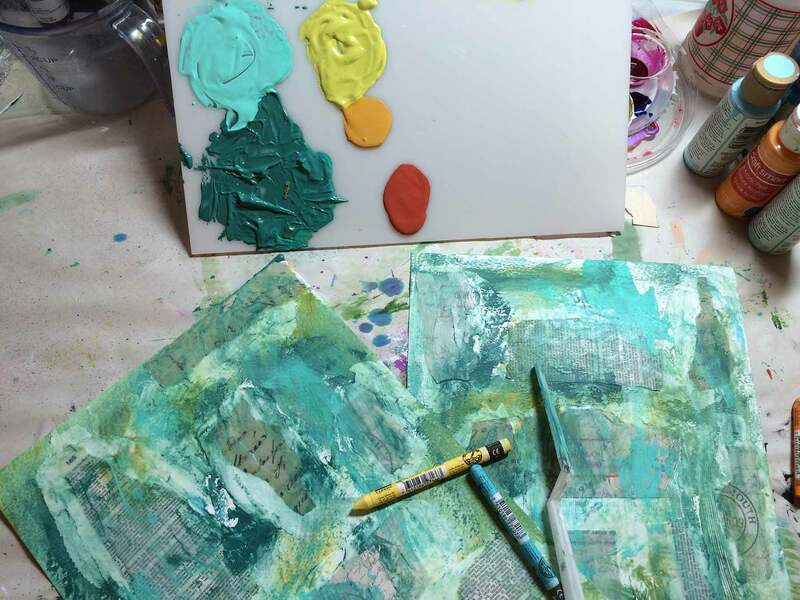 I am so impressed with your art journal project and I’m jealous of your play date! It is so BEAUTIFULLY done! Bravo! I love the video preview Vicki. What fabulous pages! It puts me in holiday mood. You are such a dear!Thank you Ona! I was thinking you made it Ona! It’s totally gorgeous I’ve edited the post to give you credit – you deserve it! Hugs!